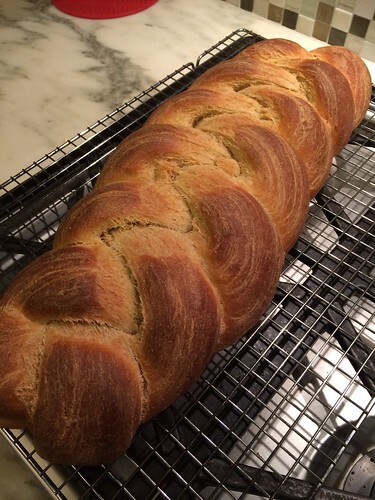 This entry was posted in baking with julia, bread, jewish, tuesdays with dorie and tagged Baking with Julia, bread, challah, Tuesdays with Dorie by bakewithamy. Bookmark the permalink. You are amazing! Three kids, training for a marathon, AND baking beautiful bread? You go girl! 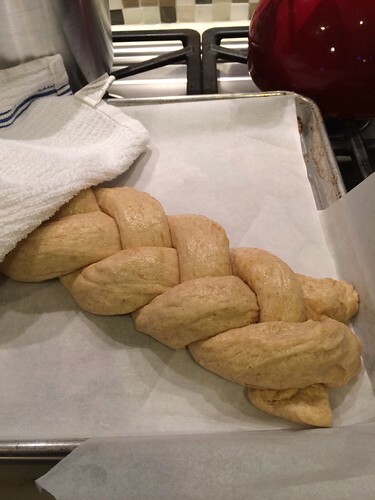 I actually ended up making a non-dairy challah because I was sharing it with a Jewish friend… I used Peter Reinhart’s recipe which worked really well. That is an impressive looking challah! And how great that you make it so often. I can’t wait to try mine for French toast! 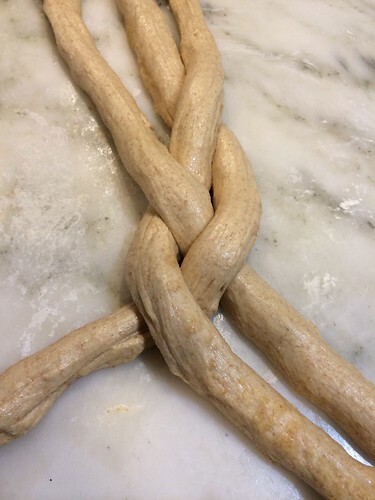 Is there much of a difference using fresh yeast? The only other time I used fresh yeast, was for croissants. I only started using fresh yeast after the croissant recipe. I could only find it sold by the pound, so I had a lot of yeast left over. I freeze it in one-ounce packets and defrost it overnight before using it. Other than that, it’s basically the same. My guess is that I could replace it with active-dry yeast without much change in the bread. I did use about 1/3 whole wheat flour, I don’t measure anymore when I bake bread, so I can’t tell you exactly how much I used. It took me a LONG time to be able to start from the middle and braid it correctly. But I think you get a prettier braid than starting at the end. BUT you have to reverse (go under) for the second half. Does that make sense? Very nice looking loaf. The wheat gives it such a pretty color.